This is what I infer from these and related passages. Prior to Jesus’ finished work, the baptism of John was an acceptable foreshadowing. However, it was a not a baptism into the Christian faith. In some sense it was a baptism that wasn’t offensive to Jews, but Christian baptism should be offensive (you know how I mean that) to Jews. You should be baptized into the entire Christian faith, which includes the Trinity and also the affirmation of the death and resurrection of Jesus. Jews might (and did) agree to John's baptism; they could never agree with a Christian baptism and remain a faithful Jew. In that way it would have been offensive. If we agree with the WCF (in this case, I do) then we acknowledge the administrator is powerless (but not unimportant.) He does what he does for the edification and pleasure of the body and for the glory of God. However the validity of the baptism depends, humanly speaking, on the understanding (worthiness) of the candidate. In correcting Apollos’ baptism there may have been some correction of the implementation and mode, but the main correction was in the lack of instruction of the candidate, some of whom had never even heard of the Holy Spirit. You should not. The efficacy of the baptism does not depend on the administrator. 1 We all agree for many reasons that it is more than advisable for the administrator to invoke the triune God, but what is important is that the candidate acknowledges that he/she is being baptized into communion with the triune God. If the baptism is not valid because the administrator did not say the right words, we have gone past advisability and the words have taken on the power of an incantation that are necessary to conjure up the grace of God. In this view, God might be ready to dispense grace, but He is powerless until he hears the right words. May it never be. So what about Acts 19:5 and similar passages? There are, I think, two acceptable views. One is that Acts 19:5 is descriptive and not prescriptive, while Matthew 28:19 (the Great Commission) is prescriptive. That would mean that the administrators are commanded to baptize in the name of the triune God. However, it would still not mean that a baptism where the administrator said “I baptize you in the name of the Lord Jesus” was invalid, because, again, the validity does not depend on the administrator. 1 But it might mean that the administrator will have to answer for his error. Another view is that the words used at baptism were a sort of early creed. And in the earliest baptisms, which were of Jewish converts, it may be that it seemed appropriate to emphasize the primary “new” Christian distinctive—the deity of Jesus Christ, to Jews and partially converted (to Judaism) God-fearers who already had a concept of the Father and even the Spirit. But when baptism spread to pagans it was more important to emphasize all three persons of the Godhead, since all were equally unknown. I don’t know the answer, but I know this: you are covered either way if you baptize in the name of the Father, Son, and Holy Spirit, so why not? (Not to mention the words are beautiful and edifying.) There is no reason not to baptize in the name of the trine God. The only risk I see is if you imagine you are commanding the grace of God by uttering those words, or that you are claiming that God could not have dispensed grace if other words were used. I can't help myself. 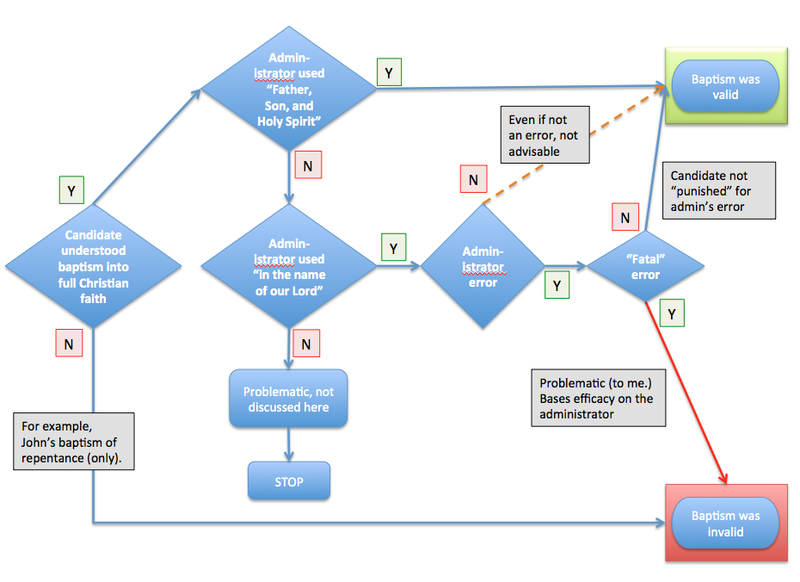 I have to represent this by a flow chart (click to enlarge). 1 Let’s not introduce absurdities. We are talking about modest deviations within the orthodox practices of pastors who are attempting to honor and glorify God with reverence. If someone was baptized by being shot with a water pistol, I’d advise them to switch churches and do it again, even if as the candidate they had a proper understanding of what they were assenting to. Have you heard, or thought on the significance of the baptisms reported as performed under the authority of the Lord Jesus by His disciples in John 3:22,26; 4:1,2? In his work, "The Life and Times of Jesus the Messiah", Alfred Edersheim suggests that the Lord's authorization of those baptisms was His personal testimony to the heavenly source of "the baptism of John." He was, in effect, continuing John's work seeing that John would soon be ending his assigned ministry. The Lord Himself, by being Himself baptized by John, and then by authorizing His disciples to baptize, was answering beforehand His later question to the Pharisees: "The baptism of John, whence was it? from Heaven, or of men?" How does that idea strike you? IMO, John's baptism was from Heaven, but it was no longer sufficient following Christ's finished work. You could not be baptized into the Christian faith until Christianity was "finalized" with the resurrection. And afterwards, you should be baptized into the fullness of the faith.